As a work intended as concise supplementary reading for undergraduates, in the general pattern of Harlan Davidson’s American and European History Series, Paul Dosal’s Cuba Libre is a smashing success—relating the fascinating history of the island nation in 150 pages of lively narrative—one that will set the tone for the volumes to follow. 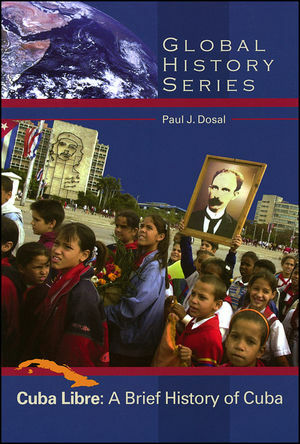 In its selection of facts and figures and steadily paced storyline, this succinct history of Cuba, from first contact with Europeans to the present, will appeal to students and instructors alike as interesting and informative reading for the Latin American and World History surveys, as well as specialized courses in Cuban history of Latin American-U.S. relations. Paul J. Dosal, born and raised in Tampa is a fourth-generation Cuban American, a descendant of the cigar makers who founded Ybor City in the late nineteenth century. He received his Ph.D. in History from Tulane University in 1987 and taught at the University of Massachusetts-Amherst (1987-95) before returning to his home town to teach at the University of South Florida. He has published Doing Business with the Dictators: A Political History of the United Fruit Company in Guatemala, 1899-1944 (1993), Power in Transition: The Rise of Guatemala’s Industrial Oligarchy, 1871-1994 (1995); and Comandante Che: Guerrilla Soldier, Commander, and Strategist, 1956-1967 (2003). He teaches graduate and undergraduate courses on Latin American Civilization, Revolutions in Latin America, Cuba, and United States Relations with Latin America.